A little bit behind the times on this one, and possibly redundant as a consequence, but a new Passion Pit track debuted on Pitchfork the other day. More importantly, it's actually rather good. And even more insanely, another track appeared online and is also good fun. Such was my shock that I decided to make this blog post rather than post a little [Twitter] update. I really had Passion Pit down as one hit wonders after disappointing recent single 'The Reeling' and last year's Black Kids debacle. Kicking off like a warped version of 'There She Goes' by The La's, 'Moth's Wings' almost immediately moves into Frightened Rabbit meets The Polyphonic Spree territory. By that, I mean a stunning combination of melancholic lyrics, pounding drums, big choruses and an overwhelming sense of euphoria. Shame it isn't a single, it's certainly one of my favourite tracks of the year and might have put paid to those MGMT comparisons. Although other new-song-off-album 'Little Secrets' is a more typical synthy hipster party jive - albeit with added catchy singalong fun from a bunch of kids who were probably passing by the studio during recording or something. It also sounds a bit like Michael Jackson covering the amazing Talking Heads track, 'Once In A Lifetime'. I say that more as a justification to repost this bizarre video of Kermit the Frog pretending to be David Byrne but 'Little Secrets' is pretty ace too. Same as it ever was. 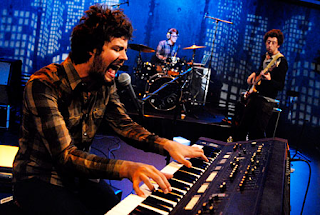 Passion Pit are touring the UK in May, prior to the release of their debut album, 'Manners' out on May 18th. Preorder 'Manners' at [Play.com] for £8.